A column Jamal Khashoggi filed shortly before he went missing early this month was published online by The Washington Post on Wednesday evening. In the column, the Saudi journalist argued in favour of a free press in the Middle East. 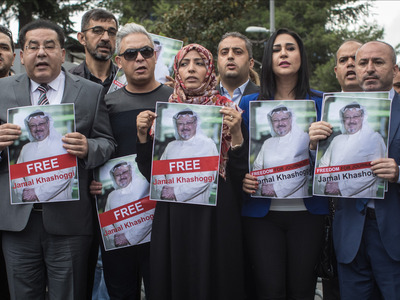 “Arab governments have been given free rein to continue silencing the media at an increasing rate,” Khashoggi wrote. Khashoggi disappeared after entering the Saudi Consulate in Istanbul on October 2 and is feared dead. Khashoggi called for the creation of an “independent international forum” to allow ordinary people in the Arab world to address “the structural problems” their societies face. Karen Attiah, the Global Opinions editor at The Post, wrote a note at the top of Khashoggi’s newest article. Turkish officials have accused Saudi Arabia of brutally killing Khashoggi, a Saudi national who often criticised the Saudi government in his reporting. The Saudi government has vehemently denied these allegations but, after more than two weeks, still hasn’t provided any evidence Khashoggi is alive. Chris McGrath/Getty ImagesKhashoggi disappeared after entering the Saudi Consulate in Istanbul in early October. Khashoggi had a rich, complicated career before he went missing. As a young reporter, he travelled to Afghanistan to interview Osama bin Laden, who at the time was among CIA-backed militants fighting the Soviet Union. Khashoggi also covered the Gulf War, and his time as a foreign correspondent quickly propelled him into a successful career as a journalist and editor in Saudi Arabia. The media industry in Saudi Arabia is strictly controlled by the government, which meant Khashoggi developed close ties to the country’s leadership over the years. He eventually served as an adviser to the royal family. But he began to fear for his safety last year as Crown Prince Mohammed bin Salman moved to consolidate power, arresting fellow princes and businessmen – including friends of Khashoggi. After Khashoggi was critical of President Donald Trump and the Saudi government’s apparent trust in the US leader, the royal family barred Khashoggi from writing. Six months later, in June 2017, Khashoggi left for the US. Before his disappearance, Khashoggi split his time between the US state of Virginia, Istanbul, and London, and was a US resident with a green card. He wrote for The Washington Post after leaving Saudi Arabia. The Saudi journalist was weeks away from marrying his Turkish fiancée, Hatice Cengiz, when he disappeared. Khashoggi went to the consulate on October 2 to obtain documents that would allow his marriage to move forward. Cengiz waited outside for Khashoggi for roughly 11 hours, but he never returned. “His voice and his ideas will reverberate, from Turkey to Saudi Arabia, and across the world,” Cengiz added.